← How Energy Efficient Is Your Home? Your air conditioning unit is a complex series of mechanical parts that is designed to keep you cool during the warm seasons. If the evaporator coil keeps freezing up, though, this indicates that there could be a serious issue. Find out what the coil is, why it freezes up and what you can do to fix it. The air conditioning coil, which is called the evaporator coil, is essentially the most important part of your unit. It is constructed of aluminum fins bonded to internally grooved aluminum tubing. As the warm air in your home passes over these coils, the heat is removed from the air and cooler air is filtered into your home via the system. The evaporator coil works directly alongside the condenser; the evaporator coil removes the humidity from the air and the condenser condenses this humidity into water for elimination. As a homeowner, it is likely that you don’t notice a problem with your air conditioning system until it runs continuously or not at all, the air in your home is too warm, or the airflow coming through your vents is significantly reduced. 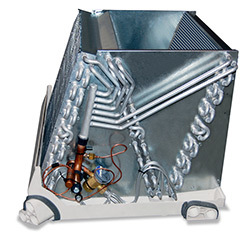 One of the main causes of reduced airflow is a frozen evaporator coil. The coil itself is typically located inside the air handling unit in your home. If air cannot flow through it freely due to a buildup of ice, then the air that is processed by the system lowers in volume and this becomes noticeable as your home gradually gets warmer. There are two primary things that can cause your evaporator coil to freeze. The first is a lack of airflow across the coil in general. Remember that there is refrigerant flowing through the copper or steel tubing that is designed to remove the humidity from your home. If there is no humidity to remove, or even if airflow is blocked for some reason, ice will begin to develop. Second, your coil can freeze if there is a problem in the refrigeration system itself. Air conditioning units with a low level of refrigerant can freeze, and if this is the case, your unit will need servicing. The good news, though, is that you can generally defrost your evaporator coil at home with a bit of patience. First and foremost, if you notice that your air conditioner is frozen, simply turn it off. Now, you won’t want to defrost it too quickly because it could overload the condensate drain and cause water damage. In order to defrost it slowly, go to your thermostat and move the fan switch from ‘Auto’ to ‘On’. This will force the warmer air in your home over the ice to defrost it. You should never be tempted to use a blow dryer or a heating pad as this will cause the ice to melt far too quickly. If these steps resolve your air conditioning issue, then you can turn the unit back on and allow it to run as normal. However, you should call in a trusted A/C company to do an annual maintenance on the system and check to see what is causing the problem. Posted in Air Conditioning FAQs and tagged air conditioner, coils, evaporator coil, freezing, freezing up, maintenance.